As my colleague Jake Davis and I were planning this blog post, we had a lengthy conversation about what we were going to focus on. If you’ve experienced even one holiday season as a digital marketer, you know there’s a ton of crucial decisions to be made about your Q4 digital endeavors. Some of our clients have been planning since the end of the summer for “prime time,” and more than a few mentioned that they earn up to 40% of their annual revenue between October and December. Jake and I are both marketers – my perspective is from the strategy and planning angle, while Jake is The Man when it comes to data and analysis. Together, we make each other better by challenging each other’s ideas and perceptions. We think this blog post captures the best of both of our perspectives. Ultimately, there are a lot of variables at play all year long, but making smart decisions about creative, segmentation, deployment time, content, etc. carries a lot more weight as you close out Q4. 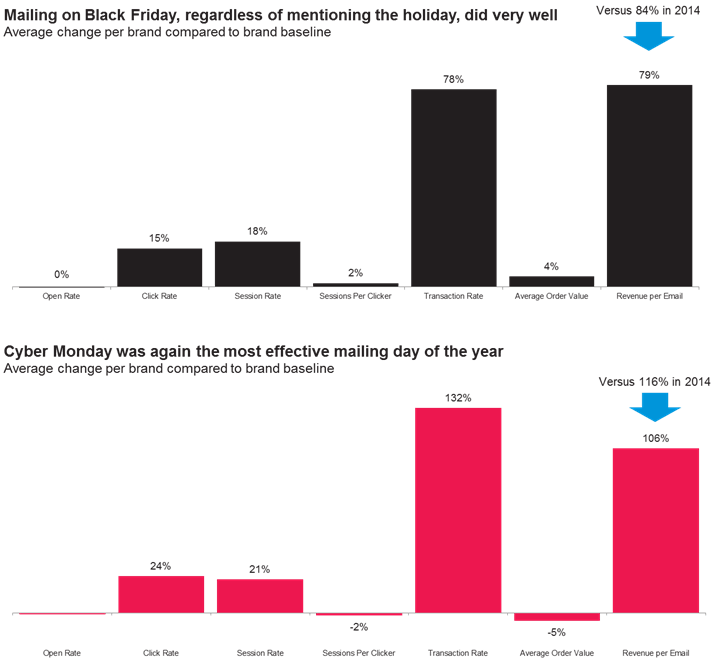 I am interested in volume trends and thematic changes through the holiday season; because I believe marketers truly want to be proactive about crafting their holiday plans. In the real world, however, the calendar is a living document and a moving target – if a brand is not hitting its projections, course correction at the 11th hour can happen. Our goal is to ensure that type of recalibration is more the exception than the rule (and to give you some pointers even if you find the calendar is more of a guide than a concrete plan). Jake and our analytics team do some of their most innovative analysis annually, after the holiday season. That analysis of the 2015 holiday season, along with projected trends and industry developments, is what we are using to help frame this particular piece of thought leadership. Black Friday and Cyber Monday still have a hold on the public’s attention and wallet, even with promotions that began at the end of October. Factor in mobile shopping, and Cyber Monday in particular could be especially lucrative: mobile first consumers are ready, willing and even more able to make purchases from virtually anywhere, not just in front of their computers or tablets. But expect a decline in email marketing effectiveness from the year before…for all of the same reasons it will be so lucrative elsewhere. Batch and blast is probably here to stay, no matter how much we preach about the long-term benefits of smaller, targeted campaigns. Even the savviest marketers will resort to some large sends this holiday season, so when you do, it will serve you well to remember this maxim: volume is negatively correlated with email KPIs. Your send size might be the only reason you see a decline in your open rate – and that’s just math! Animation has been around for a while now, but that doesn’t mean it’s any less effective. Last holiday season, mailings that included animation were clicked on 30% more than expected based on other trends. While that might because only the best mailings get this treatment, expect animation to get your customers moving. Free shipping was the most popular offer in 2015, although slightly less effective than 2014. As recent news about an increase in shipping rates reaches consumers, free shipping could prove to be even more compelling than past years. 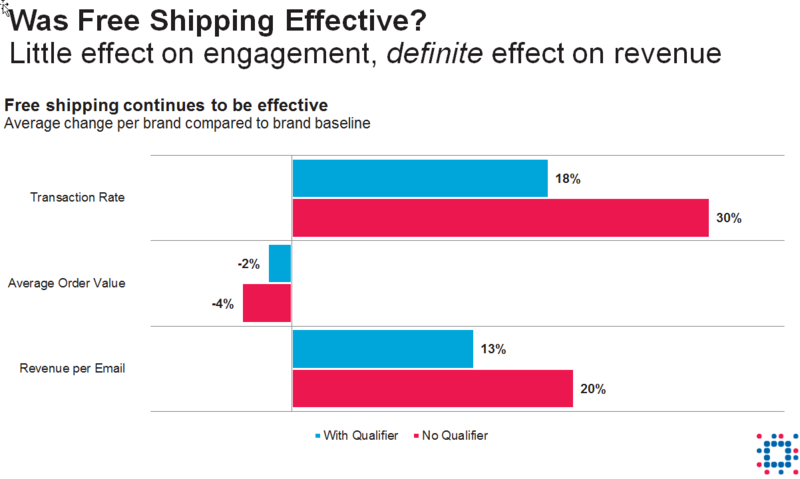 On the other hand, marketers that offer free shipping may see their bottom line affected (so prepare for Free Shipping with higher qualifiers, and remind your consumers about all the other great benefits they’ll receive by shopping with your brand). As with last year, our ultimate take-aways included the strong Jake and Liz approved suggestion to look at performance from your digital channels in a holistic sense. How have you been communicating with your customers the entire year? Is your website mobile optimized? Is your content personalized and relevant? Are you targeting the right audience? Are you using browse and abandon behavior to send triggered emails and make product recommendations? Most importantly, do you understand the context in which you’re deploying your email? It’s a competitive world out there, and most everyone has the same tricks up their sleeves. Be creative and daring when thinking of what minor innovations could prove major to your bottom line. While the charts above describe holiday 2015 (and rest assured, they will likely describe holiday 2016), it’s the tiny variations – the curious interpretations – that will drive your program forward. And when you’re struggling to come up with that variation? We’re here to help. Read more analytics posts here. The post 4 charts that explain email marketing during the holidays appeared first on Marketing Forward Blog.